Denice Barnes Disability Minister John Ajaka (centre) meets with Kevin Johnston and Judy Andrews at Woongarrah. THE land has been bought, the development application approved — all that’s needed is the cash to build two purpose-built homes in Gorokan for people with disabilities. 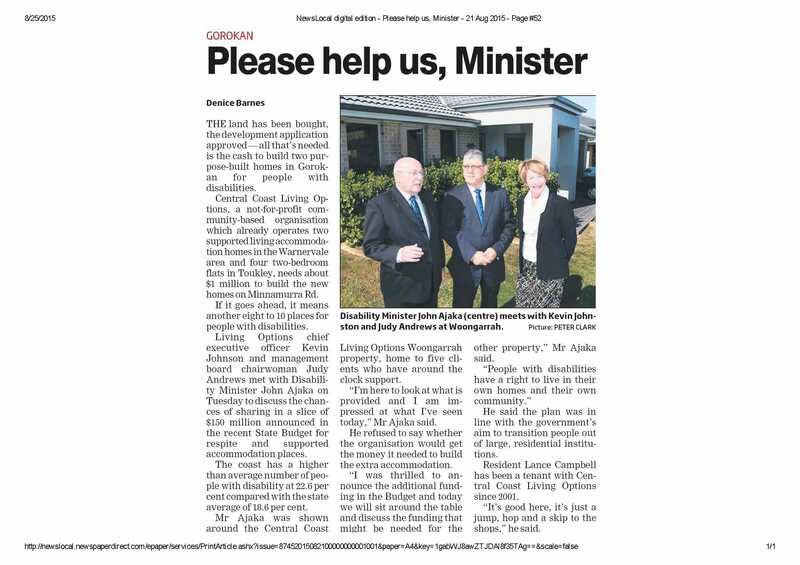 Central Coast Living Options, a not-for-profit community-based organisation which already operates two supported living accommodation homes in the Warnervale area and four two-bedroom flats in Toukley, needs about $1 million to build the new homes on Minnamurra Rd. If it goes ahead, it means another eight to 10 places for people with disabilities. Living Options chief executive officer Kevin Johnson and management board chairwoman Judy Andrews met with Disability Minister John Ajaka on Tuesday to discuss the chances of sharing in a slice of $150 million announced in the recent State Budget for respite and supported accommodation places. The coast has a higher than average number of people with disability at 22.6 per cent compared with the state average of 18.6 per cent. Mr Ajaka was shown around the Central Coast Living Options Woongarrah property, home to five clients who have around the clock support. “I’m here to look at what is provided and I am impressed at what I’ve seen today,” Mr Ajaka said. He refused to say whether the organisation would get the money it needed to build the extra accommodation. “I was thrilled to announce the additional funding in the Budget and today we will sit around the table and discuss the funding that might be needed for the other property,” Mr Ajaka said. He said the plan was in line with the government’s aim to transition people out of large, residential institutions. Resident Lance Campbell has been a tenant with Central Coast Living Options since 2001. “It’s good here, it’s just a jump, hop and a skip to the shops,” he said.